Nathaniel Edwards: Who Would Have Won the 1994 World Series? Who Would Have Won the 1994 World Series? What would have happened if the 1994 season of Major League Baseball had actually happened in full, instead of being cut off by the strike? Who would have won? Could any records have been broken that year? I've asked the two top baseball simulators these questions to see what they came up with. 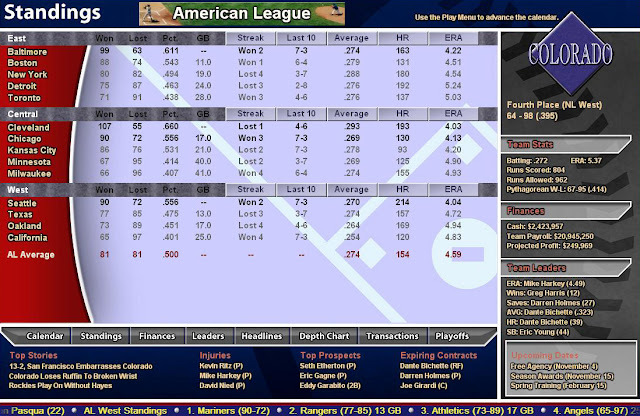 To begin with, here's Out of the Park Baseball, my favorite baseball sim. Let's sim through 1994 once and see what it comes up with, then later we'll simulate this year several times to get a less luck-dependent prediction. 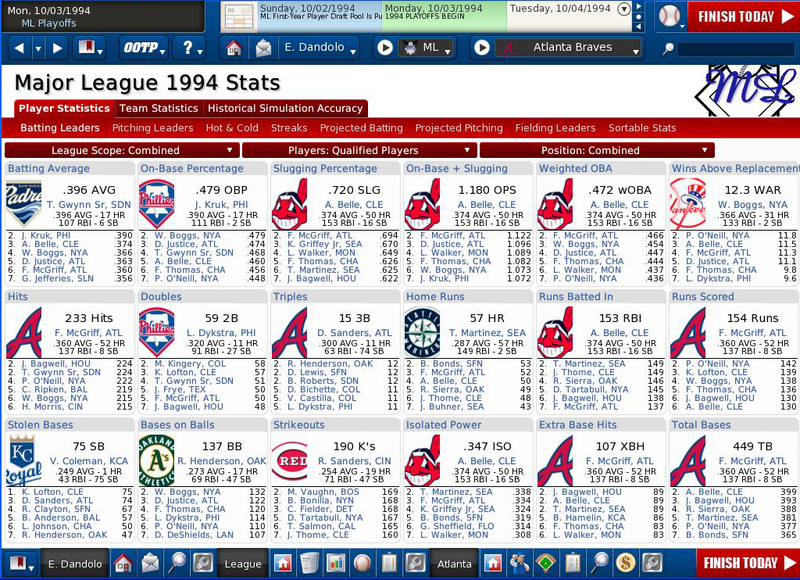 The common view of 1994 is that the Montreal Expos were screwed out of one of their best years, and OOTP agrees, but it still thinks the 90s Braves had them beat that year by 3 wins. The Braves were only one of four teams with more than a hundred wins that year though, so OOTP considers 1994 a very lopsided field in terms of team talent. The playoff teams, as you can see above, are the Indians, Yankees, Mariners, White Sox, Expos, Astros, Padres, and Braves. Here are the batting stats leaders for 1994, and you'll notice it's basically all Fred McGriff and Albert Belle. 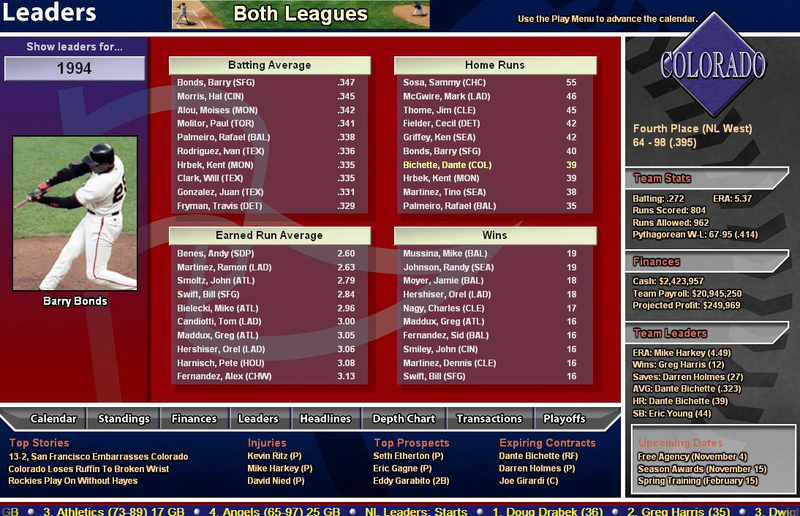 This season of OOTP had Crime Dog put up one of the best seasons ever while Tony Gwynn nearly hit .400, and yet somehow Wade Boggs is the one leading both leagues with a preposterous 12.3 WAR. Boggs is nowhere to be seen on the doubles, triples, or home run leaderboards, but his OBP of .479 and decent contribution in every other hitting stat powered him to one of the greatest WAR numbers ever recorded. I'm unsure whether the WAR in OOTP is supposed to match Baseball-Reference's WAR calculations or those of Fangraphs, but either way I'm almost certain we've never had five hitters with 10+ WAR in a season. Boggs' 12.3 WAR is a Barry Bonds/Babe Ruth type number in either formula, so that honestly lowers OOTP's credibility a bit in my book. Here are the pitching stats, in which Greg Maddux had a ho-hum, regular old Maddux year that's actually worse than his real-life stats in '94 or '95, yet his WAR still came out to 12.4, which is way, way too high. According to B-R, Maddux's best season was 8.8 WAR and Fangraphs says it was 8.2 WAR. So not to keep harping on it, but OOTP needs to work on its WAR formulas. Here's how the playoffs went. The Chicago White Sox won a World Series 11 years early and the Braves get yet another 90s World Series loss, which they surely didn't have enough of in real life. Frank Thomas out-slugs Crime Dog and the Braves' pitching staff. So how did the rest of the OOTP simulations go? 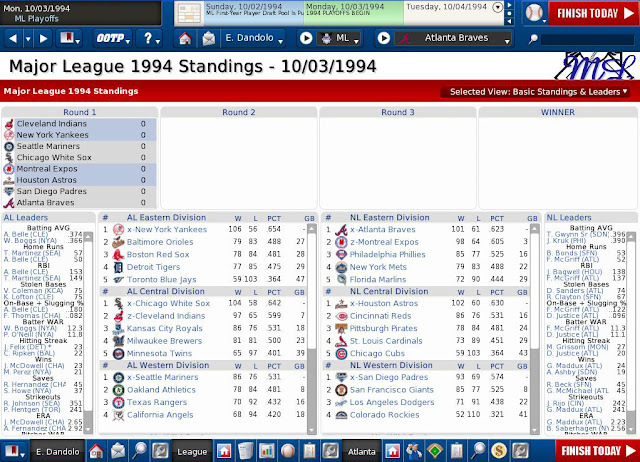 In ten simulations, the Houston Astros were the most successful with three World Series championships, with the Braves and Expos tied for second with two each. 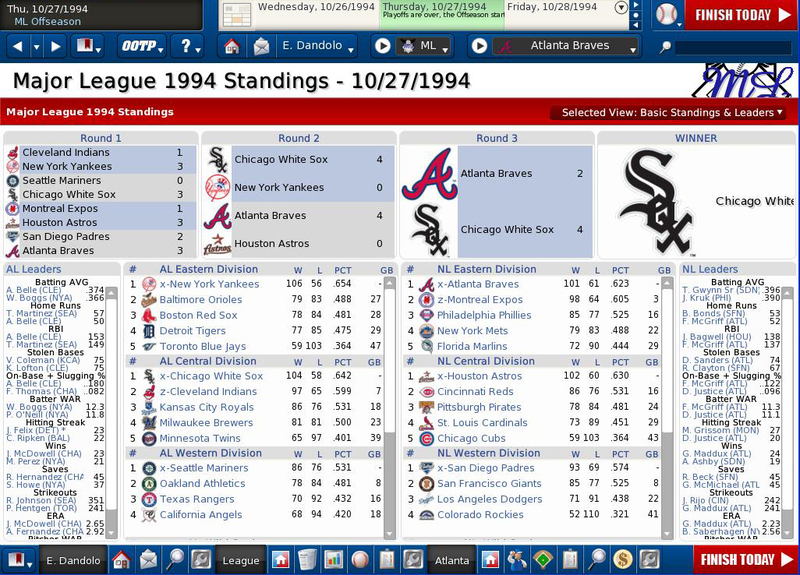 The remaining championships were won by the Yankees, White Sox, and bizarrely the Orioles came out on top one year. In one sim, Tony Gwynn did succeed in hitting .400 for the whole season, and the home run record was broken by Andres Galarraga in another. In one year, the White Sox earned 120 wins over the course of the season, and in another the Athletics won the AL West with a 79-83 record. So basically, lots of weird crap happened, but it was a lot of fun to sim through and watch. 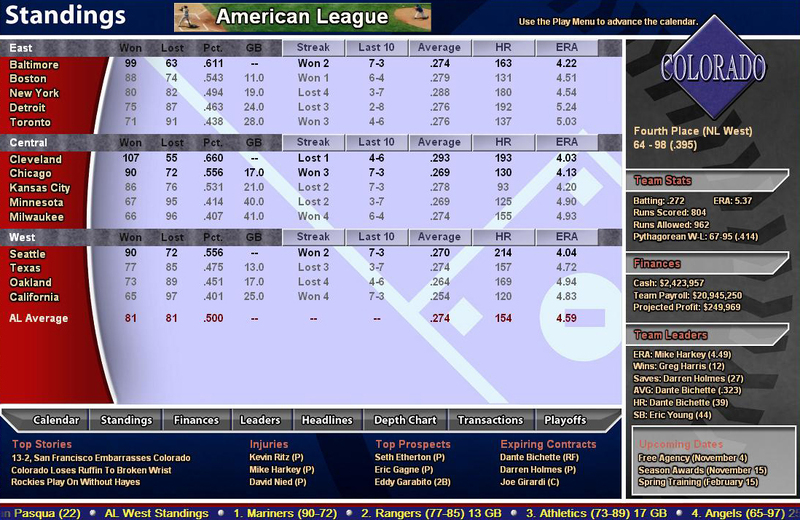 So what about the other major baseball sim on the market, Baseball Mogul? 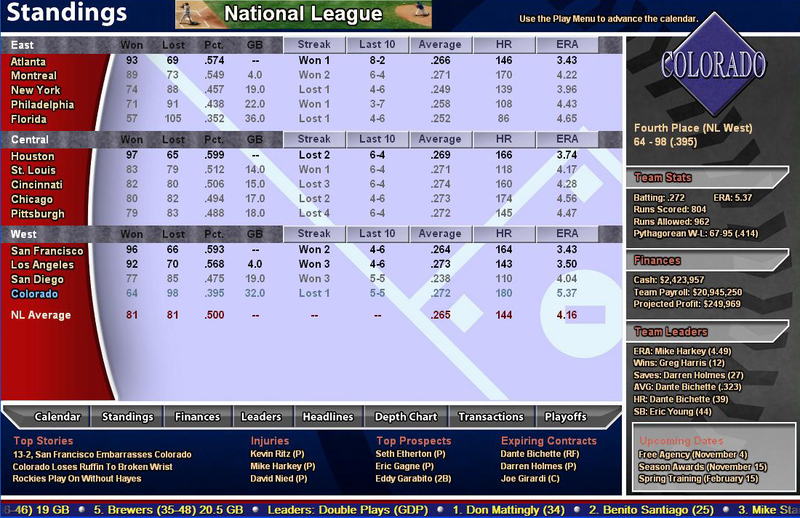 Here are the National League standings of the first sim attempted. The win numbers are much more evenly spread out, with only the Marlins and Rockies having abominable seasons, and no team won 100 games. Except in the AL Central, where the Cleveland Indians won 107 and still let up enough on the White Sox for them to capture the Wild Card. No home run records broken here, but Sammy Sosa found his serious power swing a bit ahead of schedule. 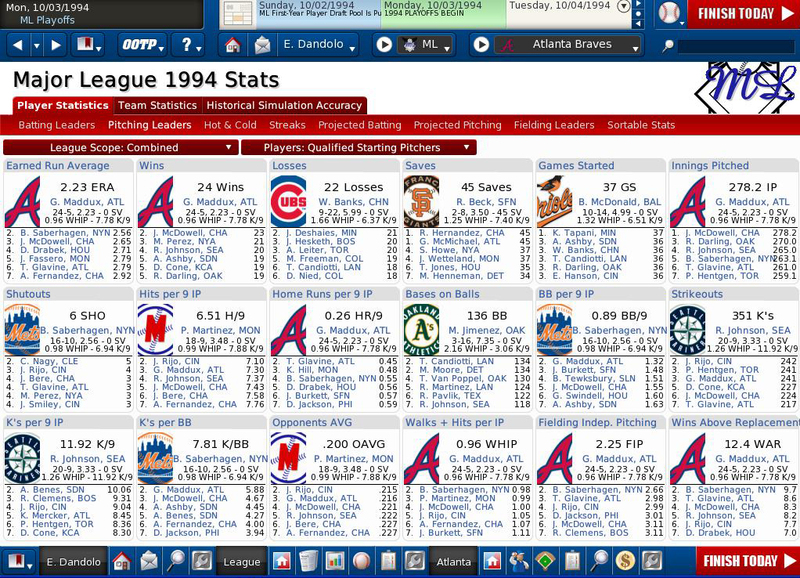 Nothing really interesting I can find here honestly, except how the hell did Andy Benes win the ERA title? And here are our playoff results, as BM clearly thought the Cleveland Indians could not be beat in '94. They won 107 games in the regular season then only lose one game in the playoffs? Jim Thome and Charles Nagy are not that good, BM. 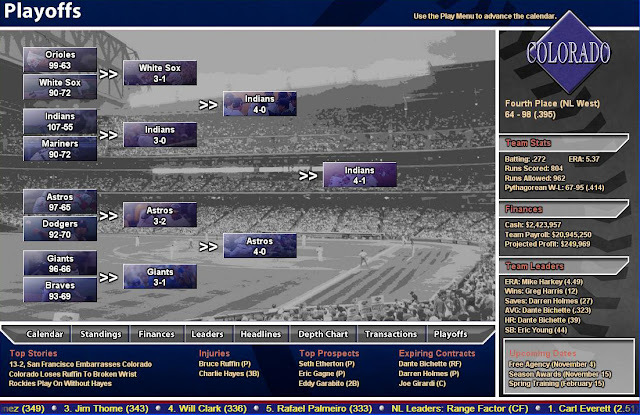 In nine BM simulations, the Cleveland Indians won the World Series three times. No one else even won twice, yet somehow the 1994 Phillies captured one championship, and even the Royals got one of their own. The White Sox, Red Sox, Expos, and Braves won the other four. The statistics coming from Baseball Mogul were significantly more toned-down, maybe to the point of being unrealistic, as literally no individual achievements stood out, but the team abilities seemed somewhat seriously out of line with reality, not that the Indians weren't a good team. But the Phillies and Royals? Sure, the Phillies had just come off of a WS loss, but that was not a good team. And I'd like to see how the Royals managed to turn Bob Hamelin into World Series rings, I really would. So a combination of the two would seem to suggest that the Braves had a pretty good shot, as did the White Sox and Astros and Indians. And Frank Thomas and Fred McGriff may have seriously added to their Hall of Fame campaigns. I also learned that I really want baseball to start up again right now.